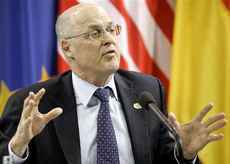 U.S. Treasury Secretary Henry Paulson expressed confidence in the global economy - "We have a very strong global economy," Paulson said after a meeting with South Korean Finance Minister Kwon O-kyu. "We have a global economy with low inflation, high levels of liquidity and I feel very comfortable with the global economy." Paulson also talked up the prospects for the US economy according to the Korean Finance Ministry " U.S. economy was successfully entering into a stable growth path, despite a slump in the U.S. real estate market"
The remarks came in the aftermath of the recent Stock Market sell off, triggered by China's Shanghai Index dropping 9% on Tuesday last week. Paulson and other Finance Ministers have been talking up the prospects for growth so as to support the financial markets, which resulted in rallies across the world stock markets on tuesday and early trading in Asia. However Paulson, declined to comment on the effects of the unwinding of Yen carry-trade positions, as he continued his asian tour in Tokyo, and scheduled to end in Shanghai, China in an attempt to get China to reform its domestic financial sector before the US Congress went further on the road to adopting protectionist policies against Asian imports. China has been able to build reserves of more than $1 trillion whilst using much of these reserves to sell the Yuan for dollars to artificially keep the currency weak, which has contributed to the record trade imbalance between the USA and much of Asia.